Rowan thinks all morris dancers are sweaty fat dudes who make a lot of noise. Seth proves him wrong. Seth may be loud, but he carries a big stick. When Seth talks Rowan into coming to a morris dancing workshop, Rowan is reluctant, but he really wants to polish Seth's stick so he goes along with it. A small (but potentially catastrophic) misunderstanding ensues, but that's AFTER a midnight swim and hot & dirty sexual encounter in Seth's camper van. 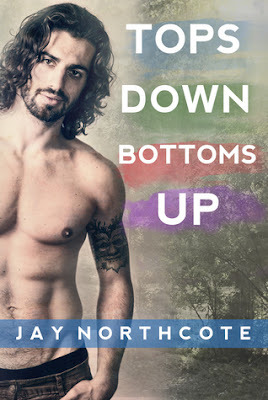 Tops Down Bottoms Up is a pure Jay book: light, steamy, funny, with a strong HFN. Because this is a novella, there isn't as much character or relationship development, but this one's all about putting aside your misconceptions and going bottoms up for your crush. Books break the shackles of time—proof that humans can work magic.